A powerful contemporary novel set in London from a master of literary fiction. People never explain to you exactly what they think and feel and how their thoughts and feelings work, do they? They don't have time. Or the right words. But that's what books do. It's as though your daily life is a film in the cinema. It can be fun, looking at those pictures. But if you want to know what lies behind the flat screen you have to read a book. That explains it all. I suppose I was lucky enough to be educated at a time when teachers still thought children could handle knowledge. They trusted us. Then there came a time when they decided that because not every kid in the class could understand or remember those things they wouldn't teach them anymore because it wasn't fair on the less good ones. So they withheld knowledge. Then I suppose the next lot of teachers didn't have the knowledge to withhold. FL Speak - A Week in December. Sounds appropriate since its December right now. But this had to be the longest week I endured. I simply couldn't finish this book in one sitting. or two sittings or three. 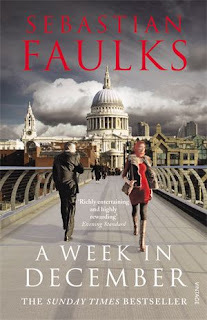 I've heard such great praise for Mr. Faulks to not pick him up again, but if his other books are anything like this one, I might have to skip. I'm not saying this is not a good book. It is. It is a complicated plot of seven different people. Its kind of intriguing and boring at the same time. For me, it inclined a bit towards the latter one. Its the modern world and these seven people are on with their lives. The story of the the Tube train driver, Jenny was simply beautiful. Addicted to online gaming, she meets Gabriel Northwood while travelling. Gabriel is another character in this book and as the pages fly by, you can almost expect to see those two together. Hassan, a young Muslim lad, slowly started going over to the dark side. His story was infact a lot interesting. Despite his inclination towards being a terrorist, you can't help feel sympathetic for the lad. There's another character, Veal's son, Finn who's more into drugs and stuff but I will skip mentioning him here. As a whole, the book fails to inspire you to finish it. I skipped boring parts (yeah, judge me!) In the end, its a satire on modern life, according to the Telegraph. The satire though, falls flat on a few occasions. sounds kinda heavy stuff :) but a decent review !